Spinach Rice is a perfect lunch-box recipe. There are so many different ways to prepare spinach rice. 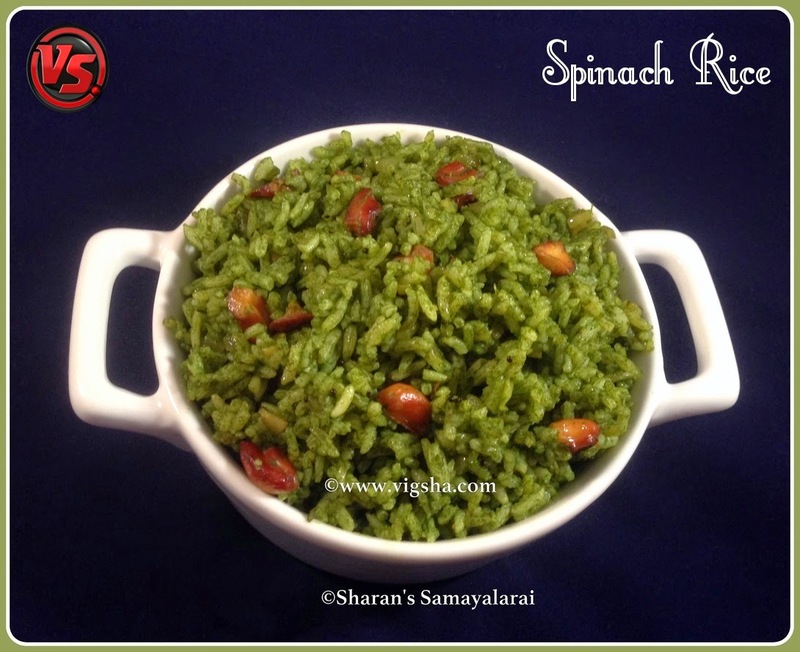 I am sharing my version of the spinach rice today.. Spinach is a rich source of vitamin A and reduces the risk of eye diseases like night blindness, itching eyes and eye ulcers. Components like beta carotene, lutein, xanthenes and zeaxanthin act as strong antioxidants and protect the eyes from the harsh effects of UV rays, further lowering the chances of cataract formation and are all beneficial for maintaining overall good eyesight. 1). Wash rice and pressure cook with sufficient water. Make sure the grains are separate(firm). Spread it on a plate and allow it cool. Wash the spinach leaves and blanch it. Let it cool and grind it to smooth puree. Keep it aside. 2). Heat oil in a pan, add cashews and saute till turns golden. Then add finely chopped garlic and saute till the raw smell goes. Then add chopped onions, hing and saute until the onions turns translucent. 3). Add turmeric powder, chilli powder, cumin powder and mix well. Then add the grounded spinach puree and needed salt. Let it cook till all the moisture evaporates and oil separates, stirring in between. 4). Finally add the cooked rice alog with a dollop of ghee to the above mixture and combine well. Switch off and close the lid, let the flavor of the ghee mix with the rice ! Serve as such or with any raita. # You can also use veggies along with grounded spinach and make it more healthy. # Adjust the spice level if you are packing this for kids lunch-box. # You can also add peanuts instead of cashews. # Adding ghee is optional. But it adds flavor to the rice. # I have used organic baby spinach, you can use any variety. # You can either puree the spinach or chop it according to your taste.